Tony Reider, president of the Flandreau Santee Sioux Tribe, wants to make his tribe the first in the nation to sell recreational marijuana. 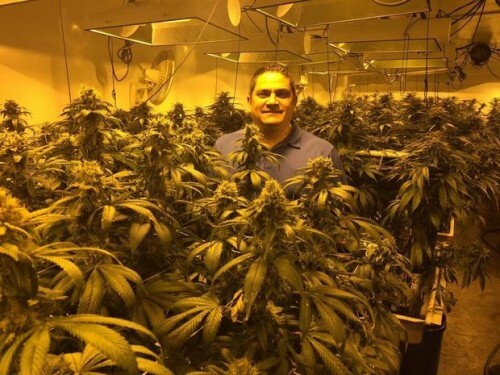 Here he’s shown under the grow lamps of a medical marijuana growing facility in Phoenix in March 2015. WASHINGTON — Tourists soon may be able to go to a South Dakota Indian reservation, buy a cigarette-sized marijuana joint for $10 to $15 and try their luck at the nearby casino. In December, the Flandreau Santee Siouxexpect to become the first tribe in the nation to grow and sell pot for recreational use, cashing in on the Obama administration’s offer to let all 566 federally recognized tribes enter the marijuana industry. The tribe plans to sell 60 strains of marijuana. Reider is hoping for a flock of visitors, predicting that sales could bring in as much as $2 million per month. “Obviously, when you launch a business, you’re hoping to sell all the product and have a shortage, like Colorado did when they first opened,” he said. Other tribes have been much more hesitant. “Look at Washington state, where marijuana’s completely legal as a matter of state law everywhere, and you still have tribes adhering to their prohibition policies,” said Robert Odawi Porter, former president of the Seneca Nation of New York. It comes as no surprise to Washington state Democratic Rep. Denny Heck, who says he works on tribal issues every day. “Not once has anybody ever brought up that they wanted to go down this track,” he said. Tribes won the approval to sell pot in December, when the Justice Department said it would advise U.S. attorneys not to prosecute if tribes do a good job policing themselves and make sure that marijuana doesn’t leave tribal lands. But federal prosecutors maintain the discretion to intervene, a worrisome prospect for many. “This administration is very pro-tribes, very supportive. What if the next one isn’t?” asked W. Ron Allen, chairman of the Jamestown S’Klallam Tribe in Washington state. He said many of the state’s 29 tribes also want assurances from federal officials that they won’t lose millions of dollars in grants and contracts if they sell a drug banned by Congress. Many tribal officials took note earlier this month when federal authorities seized 12,000 marijuana plants and more than 100 pounds of processed marijuana on tribal land in Modoc County, Calif.
Federal authorities said they raided the operation because the tribes planned to sell the pot on non-reservation land. “That’s a warning shot to Indian County that this isn’t carte blanche to do whatever you want, even in a place like California,” said Blake Trueblood, director of business development for the National Center for American Indian Enterprise Development, based in Arizona. Trueblood said marijuana could give tribes an economic boost, much like gaming. He said tribes will have the best opportunities in states such as Florida and New York, where demand for pot is high but the drug has not been legalized for recreational use by state voters. Reider said his tribe plans to sell both medical and recreational marijuana. Minors will be allowed to consume pot if they have a recommendation from a doctor. Under a tribal ordinance passed in June, adults 21 and over will be able to buy one gram of marijuana at a time for recreational use, no more than twice a day. Kevin Sabet, president of the anti-legalization group Smart Approaches to Marijuana, said the California raid shows that it’s still “an extremely risky venture” for any tribe to start selling marijuana. And he said pot sales would fuel more addiction. “If we think alcohol has had a negative effect on young people on tribal lands, we ain’t seen nothing yet,” Sabet said. As part of his homework, Reider said, he traveled to Colorado, the first state to sell recreational pot last year. He said he does not smoke marijuana but has concluded that it’s safer than alcohol, citing the behavior he witnessed at the Cannabis Cup, a marijuana celebration held in Denver in April. Reider said the tribe plans to begin growing 6,000 marijuana plants in October and is renovating a bowling alley to house a new consumption lounge that will include four private rooms. He said the tribe may consider allowing marijuana consumption in its casino in the future. Reider acknowledged that it’s “kind of an awkward feeling” to start selling pot, but he figures the tribe is well-equipped. Reider said profits from pot sales will be used to help tribal members. He said that could include the construction of a facility for those addicted to alcohol, prescription drugs or methamphetamine. Acting Chief of the Pamunkey Indian tribe Robert Gray said the tribe has its work cut out navigating the new opportunities and programs the Pamunkey people are eligible for now that they are among the more than 500 tribal nations recognized by the federal government. On July 2, the federal government extended recognition to the Pamunkey Indian tribe, making it the first Virginia tribe to achieve such recognition. In the wake of the announcement, former Pamunkey Indian Chief Kevin Brown, who has helped the tribe in its 30-year quest for such recognition, tendered his resignation as chief. “It’s been a long hard road in getting the federal recognition, and I’m passing the torch to another member,” he said, adding that it is time for someone else to take up their own cause to advance the tribe. Under Pamunkey law, Assistant Chief Gray will take over as acting chief and perform all of the duties of the chief. Gray said the Pamunkey will elect a new chief Aug. 6. The tribe, which has 203 members, has proven that it meets seven mandatory criteria for federal recognition and will join the 566 other federally recognized tribal nations across the country. The process included collecting historical governing documents, tracing the lineage of tribe members and proving the tribe has lived as a distinct community with its own political influence since 1900, according to the Bureau of Indian Affairs. The Pamunkey first applied for full federal recognition in 1982, Brown said. Washburn’s decision was a defeat for numerous groups that had opposed the petition, including the Congressional Black Caucus as well as gaming and anti-gaming interests worried about the potential for the tribe to construct a gambling complex on the 1,200-acre Pamunkey reservation. In January, several members of the Congressional Black Caucus voiced their opposition to federal recognition of the Pamunkey, asking Department of the Interior Secretary Sally Jewell and then-U.S. Attorney General Eric Holder to postpone the decision until the Justice Department investigated claims of discriminatory practices by the tribe. Brown said the tribe repealed the law in 2012. “We hadn’t enforced that law in generations and did away with it before it got out.” According to Brown, the common rationale for the ban is that it was rooted in Virginia’s culture of racism, which, at the time, used racial intermixture as a means to deprive Native Americans of their ancestral lands. The Association of American Convenience Stores also expressed fears that federally acknowledged tribes will result in competition for stores already located near reservations if a tribe decided to open a similar business on tribal lands, the reason being tribes would not have to charge taxes and a store could undercut prices. But many historians and ethnologists have long argued that the descendants of the most powerful tribe to confront Capt. John Smith and the first English settlers at Jamestown deserved official federal status. “The Pamunkey retained their original lands — their ancestral lands from the time before the English arrived — and they were the only group to do so. They’ve maintained their treaties with the government — treaties that go all the way back to the English and the 1600s,” said Buck Woodard, head of the American Indian Initiative at Colonial Williamsburg. Retired Virginia Department of Historic Resources archaeologist E. Randolph Turner II makes many of the same arguments, citing the tribe’s links to such historical figures as Powhatan, Opechancanough and Pocahontas. Brown said Gov. Terry McAuliffe called him July 2 to personally congratulate the Pamunkey on their historic achievement. In a statement issued by the Office of the Governor, McAuliffe lauded the decision. “I want to congratulate members of the Pamunkey tribe on their tireless efforts to ensure that they receive the federal recognition that they deserve.” The governor’s statement also said he has supported federal recognition of the Pamunkey and recently sent a letter to the Bureau of Indian Affair backing their efforts. McAuliffe said he hopes the Pamunkey tribe’s achievement will help enact the Thomasina E. Jordan Indian Tribes of Virginia Federal Recognition Act, a bipartisan bill that would grant federal recognition to the Chickahominy, Eastern Chickahominy, Upper Mattaponi — also located in King William County — Rappahannock, Monacan, and Nansemond Indian tribes. These tribes have been recognized by the state, but not the federal government. In a joint statement, Virginia’s U.S. Sens. Mark Warner and Tim Kaine hailed the announcement by the Bureau of Indian Affairs. They are also cooperating on the Thomasina E. Jordan Indian Tribes of Virginia Federal Recognition Act. Members of the King William County Board of Supervisors also commended the Pamunkey on their recognition. “I think it’s a great victory for the tribe, which made the first contact with British settlers 400 years ago, to finally have federal recognition,” said District 2 Supervisor Travis Moskalski. Full federal recognition now allows Pamunkey tribal members to apply for a variety of programs, such as health and housing services, as well as educational and higher-learning opportunities. Brown said there is a 90-day waiting period before tribal members can begin benefiting from such programs, and it may be years before the Pamunkey are able to construct buildings they’re provided funding for, such as a health clinic. However, Brown said the Pamunkey are eligible to use facilities and services at the reservations of other federally recognized tribes. Brown also quelled suspicions by many that the Pamunkey were planning to build a casino, which is permitted under full recognition. “Look around,” Brown said gesturing to the line of trees and rows of crops that make up a sizable portion of land on the reservation. “There’s no place for a casino here.” Brown also said the Pamunkey hired a consultant to examine whether or not the reservation’s thoroughfares could handle the traffic a casino would undoubtedly bring. It was determined the investment from reconstructing roads and building a casino would not be feasible. Gray said as much, saying the Pamunkey lack the infrastructure for a casino. “More than anything being recognized is historic vindication,” Brown said. When asked about the relevance of the decision coinciding with Independence Day, Brown chuckled. •1982: The Pamunkey Indian tribe applies for full federal recognition. •2009: The Pamunkey file a letter of intent to petition the Bureau of Indian Affairs for federal recognition. •August 2012: The BIA issues the Pamunkey “active consideration” for full recognition. •January 2014: The Pamunkey earn preliminary federal recognition. •January 2015: The Congressional Black Caucus asks the BIA to delay the decision and investigate the Pamunkey for discriminatory practices. •March 2015: The BIA extends its deadline for a final determination on federal recognition of the Pamunkey. •July 2, 2015: The Pamunkey become the first federally recognized tribe in the commonwealth of Virginia. 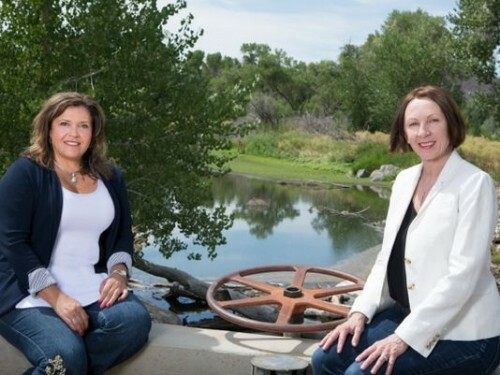 Schurz native Staci Emm and University of Nevada, Reno professor and Interdisciplinary Outreach liaison Loretta Singletary, a former extension coordinator at the Yerington office of the UNR Cooperative Extension, have been named to a new team that has been formed to integrate research and Extension to help Great Basin and Southwestern tribal communities develop plans, policies and practices for sustainable agriculture and water management. The program is part of a competitive, $4.5 million grant awarded by the U.S. Department of Agriculture’s National Institute of Food and Agriculture. The five-year program, Native Waters on Arid Lands, brings together faculty and students from three of the West’s 1862 land-grant institutions — University of Nevada, Reno, University of Arizona and Utah State University; First Americans (1994) Land-Grant Consortium (FALCON); Federally Recognized Tribal Extension Program instructors in Nevada and Arizona; Desert Research Institute; U.S. Geological Survey; and Ohio University. The program team includes tribal members from Nevada, Utah, Arizona and New Mexico. American Indian farmers and ranchers provide an important economic base for the arid lands of the Great Basin Desert and American Southwest. Declining water supplies, urbanization, ecosystem change and federal Indian policies challenge American Indian agriculture for ceremonial practices, sustenance and trade. Singletary said the group will be working with every tribe in Nevada, a couple in Utah, the Navajo and Hopi nations in Arizona and several small tribes in northern New Mexico. “The foundation of the project is working with tribal communities through focus groups and tribal engagement about what their challenges are and what their ideas are for possible ways and strategies to use their water,” Singletary said. Singletary said American Indian land tenures have presented challenges to tribes and impacted their ability to manage water and other natural resources well. Program elements include developing climate scenarios and water supply projections for tribal lands; testing the production efficiency of existing and future water systems; assessing the effects of Indian land tenure on water management and agriculture; considering the applicability of alternative water management policies; and integrating paleoecological data with tribal knowledge to understand the impacts of a changing climate. Other senior members of the Native Waters integrated program team include Singletary, professor and interdisciplinary outreach liaison with University of Nevada Cooperative Extension, leading collaborative research and Extension outreach; Emm, associate professor and Extension educator with University of Nevada Cooperative Extension, leading outreach and coordinating the tribal advisory council and annual tribal summits; Michael Dettinger, senior hydrologist with the U.S. Geological Survey, leading climate research; Beverly Ramsey, executive director of Division of Earth and Ecosystem Sciences with Desert Research Institute, leading the traditional ecological knowledge research; Bonnie Colby, professor with the Department of Agriculture and Resource Economics with University of Arizona, leading water market economics research; Trent Teegerstrom, Arizona Federally Recognized Tribal Director and Extension specialist, coordinating tribal education and outreach in Arizona; Kynda Curtis, associate professor in the Department of Applied Economics at Utah State University, leading agricultural production economics research; Eric Edwards, assistant professor in the Department of Applied Economics at Utah State University, leading property rights economic research; Derek Kauneckis, associate professor with Ohio University’s Voinovich School of Leadership and Public Affairs and affiliate faculty member with the Desert Research Institute, leading water rights policy research. Tribal members of the Native Waters on Arid Lands program team include Emm (Washoe and Paiute American Indian and Yerington Paiute tribal member); Ramsey (Eastern Band of the Cherokee Nation); Curtis, Cherokee descendant; Gerald Moore (Navajo) and Arizona Federally Recognized Tribal Extension Program for Arizona educator, coordinating tribal engagement with Navajo and Hopi tribes; Reggie Premo (Duck Valley Shoshone Paiute) coordinating tribal engagement with Nevada tribes; Vicki Hebb (Cheyenne River Sioux Tribe of South Dakota) organizing and facilitating the tribal summits; administrators, faculty, staff and students from the 1994 tribal land-grant colleges and universities; and American Indian water specialists, cultural advisors, agriculturalists and educators from the region. “We look forward to working with communities throughout the Great Basin and American southwest to help manage water resources for our future generations,” Phillips said of the collaboration. Swinomish staff and OSU students sample clams on Kukutali Preserve. Researchers from Oregon State University (OSU) are studying shellfish contamination on the Swinomish reservation and nearby Fidalgo Bay. 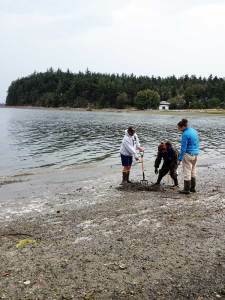 Both the Swinomish Tribe and Samish Nation have partnered in the project with OSU’s Superfund Research Program, focusing on clam contamination on tribal lands. Butter clams were sampled from sites in Fidalgo Bay near an oil refinery, and from the relatively pristine Kukutali Preserve. Kukutali is co-managed by the Swinomish Tribe and the state of Washington. The samples are being analyzed in Professor Kim Anderson’s lab at OSU’s department of environmental and molecular toxicology. Swinomish clam digger Benny James helped the OSU researchers locate butter clams on Kukutali. Butter clams specifically were sampled because they are an important part of the tribe’s traditional diet. “The information will help us understand how much of these types of chemicals are already in the area, and how much we will have to clean up in the event of an oil or coal dust spill,” said Jamie Donatuto, Swinomish environmental health analyst. The OSU team also tested a way to measure contamination using passive samplers. At each site where a clam was sampled, the team placed a small membrane in the sediment to soak up the chemicals. The results from the passive samplers will be compared to the data from the clams. Pedestrians of American Indian descent at are at higher risk of death in Washington state, according to a report released Tuesday by the National Complete Streets Coalition, a branch of Smart Growth America. Washington placed 36th out of 50 states and the District of Columbia in a ranking of the most dangerous states to the least dangerous based on the Pedestrian Danger Index, a combined measure of total pedestrian deaths, annual pedestrian deaths and the percentage of people commuting by foot over the past five to eight years. The Seattle-Tacoma-Bellevue area ranked 49th out of 51 large metro areas. But for Washingtonians of American Indian descent, the statistics aren’t as reassuring. Nationwide, Native Americans have higher rates of fatal traffic accidents than other ethnicities. 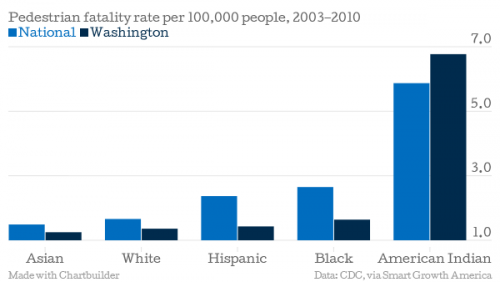 But that difference is particularly notable in Washington state where all other ethnic groups’ fatality rates are consistently lower than national averages. 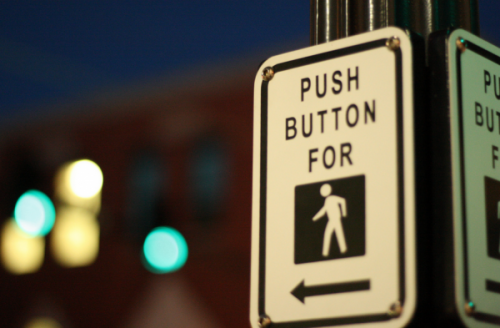 Both statewide and nationwide, most pedestrian deaths occur in the more populated urban areas. But according to state data, more Native Americans were killed in crashes on rural roads than on urban ones, opposite the pattern seen with pedestrians of all other ethnicities. Why? There’s no easy answer, but here are a few factors to consider. Washington state has 29 federally-recognized American Indian tribes. Alaska, California and Oklahoma are the only other states with more tribes within their borders. According to 2010 U.S. Census data, only six states have American Indian and Alaska Native populations greater than that in Washington. Each reservation is its own sovereign nation with its own laws, which means roads and signs are built and distributed differently. In rural areas, on tribal lands or off, there aren’t always sidewalks, and not all roads are well-lit. According to the Center for Disease Control and the National Highway Traffic Safety Administration, Americans of Native American and Alaska Native descent tend to be at higher risk of car injuries overall, not just as pedestrians. Some tribes don’t have seat belt laws. Alcoholism is often cited as a contributing factor. But intoxication, particularly intoxicated pedestrians, is a contributing factor across the board and is not limited to one ethnicity. Even with the comparatively high rate of Native American pedestrian deaths reported, we may not be getting the full picture. Because each reservation is a sovereign nation, not every tribe shares data with the state, and the data that is available is conservative. Thomas Holsworth is commander with the Colville Tribal Police Department in Nespelem, in northwest Washington. The reservation covers 1.4 million acres and, as in many rural areas, most of the roadways that crisscross it are narrow, windy country roads without sidewalks. The Confederated Tribes of the Colville Reservation have gone to great lengths to try to reduce traffic-related deaths on tribal lands, assimilating state traffic codes into their tribal code and launching multiple highway safety programs. Funded by a state grant, the tribes ran a public education campaign to increase awareness about using seat belts, driving under the influence, and launched projects to identify problem roads and walking paths. In the last five years, Holsworth says, there has only been one pedestrian fatality. 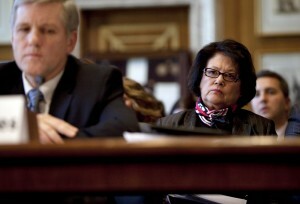 Elouise Cobell, right, looks on as Deputy Secretary of the Interior David Hayes testifies in December 2009 during a Senate Indian Affairs Committee hearing in Washington, D.C.
HELENA – The Flathead Reservation is among 21 Indian reservations that will be the focus of the next phase of a $1.9 billion program to buy fractionated land parcels owned by multiple individuals and turn them over to tribal governments, Interior Department officials said Thursday. Besides the Confederated Salish and Kootenai Tribes, other Montana participants are the Northern Cheyenne Tribe of the Northern Cheyenne Indian Reservation; Assiniboine and Sioux Tribes of the Fort Peck Indian Reservation; Crow Tribe; and the Fort Belknap Indian Community of the Fort Belknap Reservation of Montana. Government officials will work with tribal leaders to plan, map, conduct mineral evaluations, make appraisals and acquire land on the reservations from Washington state to Oklahoma in this phase, which is expected to last through 2015. Other reservations could be added to the list, but the 21 named Thursday meet the criteria, particularly tribal readiness, said Assistant Secretary for Indian Affairs Kevin Washburn. “We knew it wouldn’t be successful unless tribal leaders were interested in the program,” Washburn said. The land buyback program is part of a $3.4 billion settlement of a class-action lawsuit filed by Elouise Cobell of Browning, who died in 2011. The lawsuit claimed Interior Department officials mismanaged trust money held by the government for hundreds of thousands of Indian landowners. The 1887 Dawes Act split tribal lands into individual allotments that were inherited by multiple heirs with each passing generation, resulting in some parcels across the nation being owned by dozens, hundreds or even thousands of individual Indians. Often, that land sits without being developed or leased because approval is required from all the owners. The land buyback program aims to consolidate as many parcels as possible by spending $1.9 billion by a 2022 deadline to purchase land from willing owners, then turn over that purchased land to the tribes to do as they see fit. So far, the program has spent $61.2 million and restored 175,000 acres, said Interior Deputy Secretary Mike Connor. To buy even that much land, officials had to locate and contact owners in all 50 states and several countries to find out if they were willing to sell, Connor said. The work primarily has been focused on South Dakota’s Pine Ridge Reservation until now. Last month, tribal leaders from four reservations criticized the buyback program’s slow pace and complained they were being shut out of decisions over what land to buy. The leaders from tribes in Montana, Oklahoma, Oregon and Washington state spoke before a U.S. House panel. Rep. Steve Daines, R-Montana, who called for the congressional hearing, said he welcomed Thursday’s announcement by the Interior Department. “However, I am concerned their efforts here may not provide tribes with the necessary tools to ensure the Land Buy-Back program is properly implemented,” Daines said in a statement. He said the Interior Department should use its authority to give tribes more flexibility, and it should move swiftly to address consolidation problems on other reservations not included in the announcement. Washburn said Thursday that his agency has entered into or is negotiating cooperative agreements with many tribes in the buyback program, though others say they want the federal government to run the program. These are the American Indian reservations the Department of Interior plans to focus on in the next phase of a $1.9 billion buyback program of fractionated land parcels to turn over to tribal governments. The program is part of a $3.4 billion settlement over mismanaged money held in trust by the U.S. government for individual Indian landowners. – Assiniboine and Sioux Tribes of the Fort Peck Indian Reservation, Montana. – Cheyenne River Sioux Tribe of the Cheyenne River Reservation, Wyoming. – Coeur D’Alene Tribe of the Coeur D’Alene Reservation, Idaho. – Confederated Salish and Kootenai Tribes of the Flathead Reservation, Montana. – Confederated Tribes of the Umatilla Reservation, Oregon. – Fort Belknap Indian Community of the Fort Belknap Reservation of Montana. – Gila River Indian Community of the Gila River Indian Reservation, Arizona. – Lummi Tribe of the Lummi Reservation, Washington. – Makah Indian Tribe of the Makah Indian Reservation, Washington. – Northern Cheyenne Tribe of the Northern Cheyenne Indian Reservation, Montana. – Oglala Sioux Tribe of the Pine Ridge Reservation, South Dakota. – Prairie Band Potawatomi Nation, Kansas. – Quapaw Tribe of Indians, Oklahoma. – Quinault Tribe of the Quinault Reservation, Washington. – Rosebud Sioux Tribe of the Rosebud Indian Reservation, South Dakota. – Sisseton-Wahpeton Oyate of the Lake Traverse Reservation, North Dakota and South Dakota. – Squaxin Island Tribe of the Squaxin Island Reservation, Washington. – Standing Rock Sioux Tribe of North Dakota and South Dakota. – Swinomish Indians of the Swinomish Reservation, Washington. James C’Hair shows settlement checks from the Office of the Special Trustee for American Indians received by him and his wife Wednesday outside Atlantic City Federal Credit Union in Riverton. LANDER, Wyo. 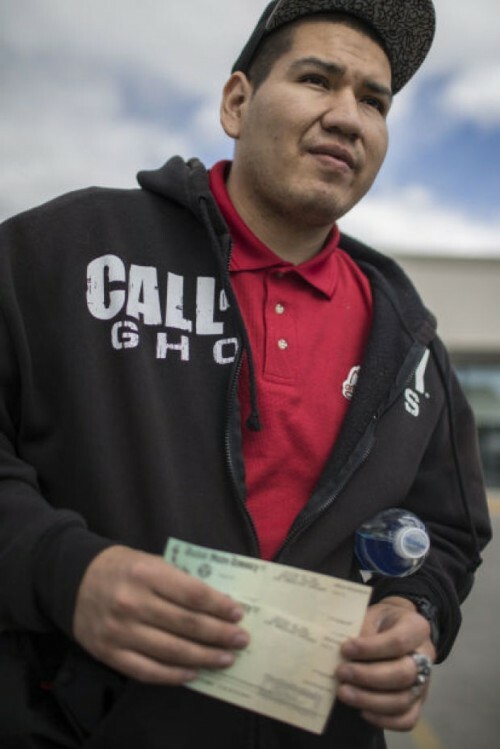 (AP) – The first installment in a $157 million federal settlement began to pour into the Wind River Indian Reservation this week, as members of the Northern Arapaho Tribe started receiving $6,300 checks in the mail. The impact of the cash infusion was almost immediately evident on the reservation and in surrounding communities, where many tribal members went to deposit their checks. Riverton and Lander, both straddling the reservation border, were bustling. Banks saw long lines. Car dealerships and auto parts stores reported brisk business. And law enforcement in both communities was highly visible, posting cruisers at banks in what authorities said was an effort to protect tribal members cashing checks from would-be assailants. Many tribal members welcomed the injection of money into a reservation long beset by poverty. Unemployment there is almost double the state average, while average family income lags far behind state and national standards. But they also expressed trepidation that the money could lead to an increase in crime, and they worried that many tribal members might squander the once-in-a-lifetime payday. The couple said they planned to use the money to pay down debt on their car and to take their five children on a trip to Albuquerque. The settlement stems from a 1970s lawsuit brought by the Northern Arapaho and Eastern Shoshone tribes against the federal government for its failure to properly collect mineral royalties from oil and gas development on tribal lands. The total settlement is worth $157 million and will be split evenly between Northern Arapaho and Eastern Shoshone tribal members. Of the total, $10 million will be used to repair environmental degradation resulting from oil and gas operations. Federal law requires that 85 percent of Native American mineral royalties be paid to individual tribal members, with the remaining 15 percent going to the tribes themselves. The distributions to individual members varies by tribe, as the Northern Arapaho and Eastern Shoshone have different-sized membership rolls. Northern Arapaho members will receive $6,300 each, while Eastern Shoshone members are to receive $15,000. Eastern Shoshone members are expected to receive their checks next week. Overton Sankey, who works at a local Head Start, said most tribal members have long prepared to receive their checks and made plans to save the money or use it for bigger purchases like cars. While Sankey is not a tribal member, his wife is, and she received a check. The couple intend to use the money for home repairs, but not before going on a trip. Businesses were bustling in Lander and Riverton. A parade of cars for sale lined U.S. Highway 287 approaching the Atlantic City Federal Credit Union in Lander. Inside the bank, Vice President of Member Services Kyleen West said the credit union had seen a steady stream of customers. The bank was cashing checks from members and nonmembers alike. It would continue to do so until it ran out of money. A first pot of cash set aside to accommodate the settlements would likely be exhausted, West said, noting that a second installment was also due to arrive to meet the second round of checks. As of midday Wednesday, all was going smoothly, she said. Local banks worked with the tribes in advance to encourage members to create bank accounts where they could deposit money. The bank has seen a rise in the number of new accounts as a result, she said. “I have been very pleased with the way the tribes have worked with the banking industry, local law enforcement and the community,’’ West said. In Riverton, Bobbi Higgs, manager of an O’Reilly Auto Parts, said the store was busier Wednesday than it is on strong Saturdays. Six cars for sale were stationed in the parking lot outside, an oddity in its own right, she said. Many of the new car owners then came into the store to buy parts, Higgs added. “Everyone is selling what they can,’’ she said. In the adjacent Ace Hardware parking lot, a relatively new 35-foot camper sold quickly Wednesday morning, she said. Law enforcement was ubiquitous in both communities. Police cars were parked outside banks, and officers stood by the doors. Police officers from around the state were called in to help. Cruisers from Cody, Jackson and Green River were stationed in front of banks in Lander, while a trailer bearing the name of the Sweetwater County bomb squad helped form a temporary command center outside Atlantic City Federal Credit Union. Lander Police Chief Jim Carey said the settlement had been well publicized, and authorities worried about outsiders who might potentially prey on tribal members cashing their checks.